Wonder Woman Premiere! Billy Gets The Lasso Of Truth After Meeting Gal Gadot! Chris Pine! Ewan Bremner! And More! Welcome back to Billy Beer’s Bar Stool. Today we are off to the Premiere for the next DC Universe film Wonder Woman. Now usually I only take days off for Marvel Premieres, but when you have the chance to get the beautiful Gal Godot, you make exceptions. Keeping Up with the Joneses Los Angeles Movie Premiere! Gal Gadot! Jon Hamm! Zach Galifianakis! Isla Fisher! 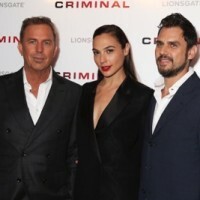 Criminal World Premiere In London! Kevin Costner! Gat Gadot! Director Ariel Vromen! And More!